Enjoy a tropical evening inside SouthEast's cozy kayak shop and hear about the trips we'll be leading this winter in the Florida Keys, mid-January through March 2011. Our small group expedition trips range from one-day paddles to Key West, easy overnights along the Seven Mile Bridge, to the infamous 100-mile paddle from Key Largo to Key West, scheduled for March 22-31, 2001, with room for several more. We'll be giving slide show presentations every hour starting at 5 p.m., followed by question-and-answer and signing copies of our Florida Keys Paddling Atlas and Knack Kayaking for Everyone.. The dates are set for our annual 100-mile paddle from Key Largo to Key West, Florida, the Southernmost Point in the U.S. 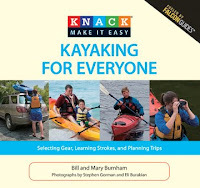 The 10-day trip will be March 22-31, 2011, kayak camping all the way. We’ll launch from Key Largo, paddle between 7 and 17 miles per day, and land 10 days later in Key West, in time for the Sunset Celebration in Mallory Square. The cost of $1,500 includes everything: kayak, gear, camping gear, all meals, and instruction along the way. From mid-January through mid-March, we'll offer customized trips ranging from one-night along the Seven Mile Bridge to 2-5 days in the Lower Keys Backcountry. The cost is $150 per person per day for however many days you want to be out. Feel free to e-mail or call 305-240-0650 with any questions! 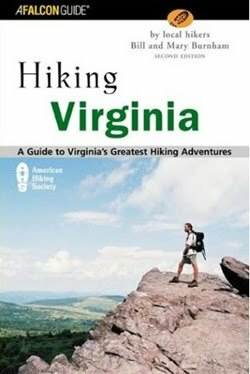 Hitting the Trail: Updating "Hiking Virginia"
When we’re not paddling this fall, we’ll be hitting the trail, quite literally, to update our first book, Hiking Virginia. It’s been 10 years since we did the initial research, so we are going to re-hike many of them, add new chapters (like James River State Park, which wasn’t even open back then! ), and add GPS coordinates and color photos to every chapter. We’re excited to make this book we love even better: a National Outdoor Book Award Honorable Mention, it has sold more than 20,000 copies. We’ll be posting trail reports here weekly, from easy walks near cities, like Newport News Park, to the lung-busting 100-plus-mile Pine Mountain Trail that follows the high ridge between Virginia and Kentucky. The first post will be up soon! 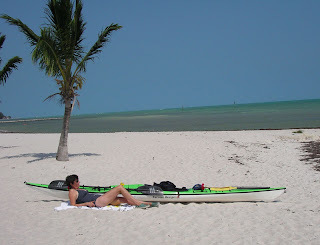 We're now taking reservations for our 2011 Florida Keys paddling trips for mid-January through March! Customized itineraries range from one-day paddles to Key West, Seven Mile Bridge overnights, 3-days in the backcountry to the full 100-mile 10-day adventure from Key Largo to Key West. Join us, outdoor writers and kayak guides Bill and Mary Burnham, for multi-day kayak camping trips in the Florida Keys this winter. You'll find yourself literally paddling from the pages of the our award-winning Florida Keys Paddling Atlas. Trips include all camping and kayaking gear, meals cooked for you, and instruction. Each couple or family will take home a signed copy of our Atlas, winner of a National Outdoor Book Award. We've just uploaded Customer Reviews from last year's trips.Visit BurnhamGuides.com to start paddling in paradise! Call 305-240-3298 or e-mail with your dates. We've chosen Onancock's Second Friday art stroll (April 9, 5-8 pm) to open SouthEast Expedition's newest kayak shop on the Eastern Shore of Virginia and debut our two new outdoor books, hot off the press! After 3 years leading kayak trips in the Onancock area for Dave Burden's SouthEast Expeditions, we are excited to now have an on-water location for tours, rentals and paddling gear. Headquartered at Sunset Beach near Cape Charles on the southern tip of the Eastern Shore of VA, SouthEast has been the premiere kayak outfitter on the shore for the last decade. The historic Steamboat Ticket Office is an ideal spot for the northern shore Onancock-area tours. It sits right next to the historic Hopkins Bros Store housing Mallards at the Wharf offering indoor and outdoor dining and entertainment by chef Johnny Mo. We've arranged with Mallards to offer delicious box lunches to our kayakers! You can see the little ticket office behind Bill in the photo above, to the left of Mallards' red roof. Both buildings are owned by the Eastern Shore of Virginia Historical Society and figure prominently in Onancock's nautical history and our historic kayak tours! The first art stroll of the year is perfect timing with the release of our two new books this month: "Knack Kayaking for Everyone" and "Best Hikes Near Washington DC." We're also fresh from paddling the 100-mile length of the Florida Keys, so we tell you all about it and will also have copies of our "Florida Keys Paddling Atlas." Come see the shop, meet other paddlers, and learn about paddling destinations up and down the Shore. If you can't make it this weekend, consider planning a visit to our wonderful harborfront town of Onancock with B&Bs, dining and galleries. Our last day paddling from Key Largo to Key West dawned clear and beautiful as we departed from Geiger Key Marina & Campground. As we passed Boca Chica Beach, we were treated to an airshow by NAS Key West. Here’s a video of an F-18 practice landing right over Bill’s kayak! From there, much of this side of the islands are undeveoped and you can see lots of birds and sealife. My kayak passed right over a 4-foot loggerhead sea turtle sitting on the bottom! We took out at Lazy Dog Adventures, where Sue is kind enough to let us haul out our boats. Our good friend Christine met us with the van and helped us load up, then we all sat down with a cold pitcher of Key West Sunset Ale from Hurricane Joe’s. We’re thinking this route would make a great day trip for next season’s trips, starting with breakfast at Geiger Key Smokehouse and ending with the sunset celebration at Mallory Square. If you’re interested, email us! This was a day of extremes, starting with a cold rainy paddle and ending with a toasty St. Patrick’s Day at the Geiger Key Smokehouse Grill (and campground, great place!). Even in Florida, especially this winter, you have to be prepared for cold, wet weather and watch for signs of hypothermia. We geared up pretty well with a synthetic base layer and rain gear. For lunch Bill pulled out the camp stove to heat up hot cocoa and tea to warm us from within! What a guy! The sun was shining when we pulled up to Geiger Key after our 11-mile paddle with plenty of time to set up camp and dry out our wet gear in the sun. That evening was St. Patrick’s Day, so we celebrated at the Smokehouse Grill tiki bar. We were joined by our friend Cameron from Big Pine Key, and met some folks from the Eastern Shore of Virginia, namely the golf pro at Bay Creek! What a small world! Here's a link to a blog post by the Pork Belly All Stars, a group of fishermen Bill took out into the Lower Keys backcountry in early March. Great guys. Hope to see you again! Today we paddled 13 miles from Big Pine Key Fishing Lodge to Sugarloaf KOA along the oceanside of the Florida Keys. Here are two videos of Jill doing the "wrap rap." (We do tend to do a lot of wrap sandwiches for lunch since they don't squoosh like regular bread!) and a silent video of ibis feeding in the flats at low tide. Kind of a "CBS Sunday Morning" feel to it. On Day 5 we were joined by an adventurous family of four for the Seven Mile Bridge crossing and a night of primitive camping and a pasta dinner on Molasses Key. From Knight's Key in Marathon, we paralleled Henry Flagler's 100-year-old bridge span and made our way to the tiny island the boys nicknamed "Survivor Island." They gathered firewood, adopted a couple of hermit crabs, and picked up what little trash we found washed up on shore. Next morning we completed the crossing, accompanied by pelicans diving for schools of shimmering, jumping fish. The boys were really wishing they'd had their fishing poles! Here's a video I took of sunrise while everyone was asleep in their tents! When you're guiding trips in the Florida Keys, you have to be prepared for a lot of things, but most importantly wind and weather. You have to be flexible. You have to be willing to adjust your route to the conditions, and you need a bail-out plan. OK, enough of the "Burn Notice" narration! Our Day 3 ended with a downpour and impending thunderstorms. We were going to camp on Long Key, but decided to take our friend Edie up on her lovely gesture of a hot shower and a warm, dry bed for the night! Edie ran support for us to prep for two paddlers joining us (and brought hot coffee!). Thanks, Edie! Day 4 dawned sunny and beautiful, but with heavy winds. Frankly, the wind kicked our butts! But we had two awesome paddlers with us, Jill and Kathy from Big Pine Key, with great attitudes and a willingness to be flexible. We launched from Long Key State Park in the lee side of what turned out to be W-NW 20 knot winds gusting to 24. Not so much a problem on the oceanside, but once we hit the Long Key Viaduct bridge, we were basically ferrying across, inching along with probably 2-3 foot swells. At the other side we tucked up into a lee and took out the sandwiches, already discussing a change in our route, which was to go to the bayside and camp at Jolly Roger Travel Park. Thankfully, there's a little marina on the oceanside not far from Jolly Roger, where they let us pull our boats up and unload. Norm from Jolly Roger was kind enough to bring his truck and pick us up with all our g ear. We had a book-signing under the pavilion and great night's sleep. Thanks, Norm, Tania, Debi and Angie at JR! Pictured are Norm, Kathy, Bill and Jill. And the truck that has bailed us out before (check out our KL2KW blog from 2008 and scroll down to Day 14!). In Memory: Today's paddle was the same one we did with our friend Krueger Nicholson (Edie's husband), who passed away this past November. 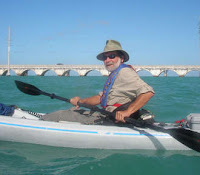 He was a ranger at Long Key State Park and a great friend to paddlers. Here he is making the same crossing of the Long Key Viaduct with us back in 2008 (under much better conditions!). We felt like he was with us on this trip. Take care, Edie, we'll see you soon. This morning at Coconut Cove Resort, Bill gavea demo of packing tips for filling a sea kayak with camping gear. Click to watch the video! Today we passed from the oceanside of Islamoarada, past Holiday Isle, cut through to the Bayside to hide from the wind and go through some beautiful mangrove creeks. We passed by many great lunch s pots: Lorelei, Morada Bay, Zane Grey Lounge, but our destination was the Kayak Shack at Robbie's Marina (home of the famous tarpon), where we met up with John, owner of this great kayak shop offering tours and rentals to Indian and Lignumvitae Key. What a chill spot to have lunch and get a healthy smoothie at the Hungry Tarpon! Our day's destination is Long Key State Park, a long day of about 16 miles. See you tomorrow! Day 2 on our 100-mile Paddle your Atlas off, Key Largo to Key West! We did about 8 miles from Tavernier on the ba yside, through Snake Creek to the oceanside, accompanied by Dave and Christine, long-time paddling buddies. We passed by reggae singer playing at the Island Grill, to land at beautiful Coconut Cove Resort, which has a lovely, shady tent area. It's really the only place paddlers can camp in Islamorada. Thank you Paul and Magda for the wonderful hospitality! They do great weddings here too, on the beach or under the tiki. Here's a video blog on the start of our 100-mile paddle from Key Largo to Key West, dubbed "Paddle Your Atlas Off" since we're doing book-signings along the way for our Florida Keys Paddling Atlas, as well as our just-released Knack Kayaking for Everyone. We have some folks joining us along the way, so stay tuned for updates on the adventures, camping all the way and stopping at historic sites and paddling under Henry Flagler's beautiful century-old railroad bridges. We started at Florida Bay Outfitters next to the famous Caribbean Club in Key Largo on Florida Bay. Along the way we passed through the magical Dusenbury Grottoes and entered another world in deep and rough Tarpon Bay. Lunch stop was on the pretty beach at Key Largo Grande Resort, where the tiki bar serves awesome grouper sandwiches and Margaritas. In about 12 miles we reached our friends Dave and Lynda's for the night in Tavernier. Here's Bill's map of today's trip (click for a larger image). The islands of the Lower Keys spread out into the Gulf of Mexico, appearing on a map as if someone smeared them across shallow waters. Islands are oriented northwest-to-southeast, divided by long, wide channels. Soft corals and sponges predominate in nearshore hardbottom environments. The channels, by contrast, are carpeted with turtle and manatee grass. As the tide goes out, sparkling white sandbars appear, a perfect spot to get out of our kayaks for a lunch or rest break. More than 200,000 acres of water and small islands make up the Backcountry. Birding is phenomenal in this vital nesting habitat for the namesake of the Great White Heron National Wildlife Refuge. Royal terns group on a sandbar near the Contents, intermingled with laughing gulls and the odd oystercatcher. Near the Mud Keys, osprey soaring high overhead issue their signature sharp-pitched whistle as they scan the water for prey. White and brown pelicans, Little Blue herons, Tri-colored herons, Great egrets, Snowy egrets, and a host of wading birds work swampy mangrove flats from Cutoe Key to Cayo Agua. A string of islands start at the Content Keys and run southwest to include the Sawyers, Barracudas, Marvin, Snipe Point, Mud Keys and Lower Harbor Keys. A small reef abruptly marks the boundary between the Keys’ shallow waters and the deeper Gulf of Mexico. A trip out to the "edge of the nearshore waters," is not soon forgotten. We offer backcountry trips at three levels. Our family-friendly excursion feature an average of seven miles daily, leaving plenty of time to explore winding creeks and shallow coves. For adventure seekers, we extend the distances (an average of 10 miles daily) and cover more ground in order to reach some truly remote areas. Our third option is a once-in-a-lifetime traverse of the entire Lower Keys Backcountry on a five-night expedition. Contact us to discuss which option fits your group's goals and abilities. Due to requests for an easy, more affordable overnight trip, we've just added a one-night, two-day traverse of the famous Seven Mile Bridge trip to our "Paddle with the Authors" itinerary. Featured in films like the Schwarzenegger blockbuster "True Lies," this engineering marvel spans a Caribbean-blue stretch of open water between Marathon and the Lower Keys. Originally built to carry Henry Flagler's East Coast Railroad, the modern highway bridge now carries cars to and from Key West. Explore and lunch on Pigeon Key, an island museum that housed bridge construction workers. Evening finds us watching egrets and ibis fish in the flats off our island campsite. As the sun sets, we'll see the distant lights of the evening commute across the bridge. Never too far from civilization, with just 7 miles of paddling per day, this trip is perfect for couples wanting a romantic getaway, or as an introduction to kayak camping. Cost per adult is just $295, all-inclusive: boat, gear, camping equipment, food and instruction. Call 305-240-3298 or e-mail us to book your trip to paradise!